Does life get any better? I keep asking myself that question and I don’t reckon it does! We have just had two of the best days in my life. I walked to Gabbie and gave her the flower Guido had had delivered via Alessandro. Gabbie pinned in straight in her hair and went to Bar Ferginando to thank Guido. She came back a few minutes later and asked us if we wanted to go out on Alessandro’s boat. Sure! Sounds great! Alessandro spoke perfect English and took us for the most delightful cruise up the Amalfi Coast. We sat back in the sun, wow-ing at the spectacular view. It is seriously one of the most beautiful places I have ever seen. Azure crystal clear water backed by impressive rock cliff faces, grottos everywhere, oh it was joy. Sheer splendid joy. No one brought a camera – so we all gazed in amazement at the beauty of the water and the coast, etching the images into our minds. He stopped the boat and we all jumped off and went for a glorious swim. Aaaaahhhh – perfecto! 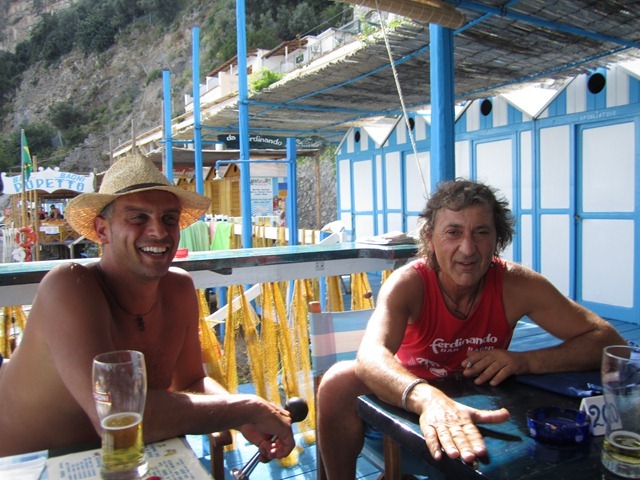 After a refreshing swim, Alessandro stopped at Positano jetty and ordered us some beers – it wasn’t a drive through as much as a ‘sail through’ – hahaha – and I was in HEAVEN. In the boat, cruising along the Amalfi Coast, chatting, laughing, sun baking, and drinking beer…bliss! We went past one boat and from a respectable distance, saw a couple making love (so Italian! anywhere!). Gabbie and I were just saying – pinch me, is this real? How did this happen? Who cares how it happened, all i knew is that I was having one of the best days of our trip so far. After a few hours out on the boat, we went back to Guido’s Bar Ferginando and had more beers and some lunch. Then more beer and a mojito – a mistake. I had to go down to the beach and I slept on a lettino until Zorba dragged me home. No disco dancing for me tonight! The next day, Zorba and I realised a dream. 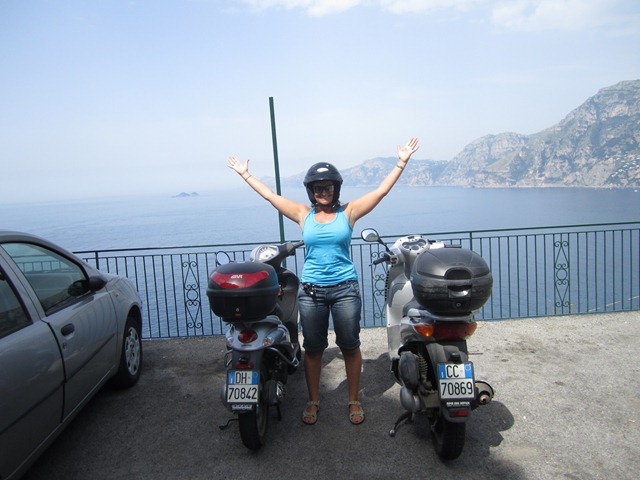 We hired scooters and rode up and down the Amalfi Coast. Regrettably there weren’t any vespas to rent, so I had a Piaggio Liberty 125cc and Zorba had a 150cc Honda. We would have hired scooters sooner except that the hire places in Positano are ridiculously expensive. 65 euro per day, EACH. No way. 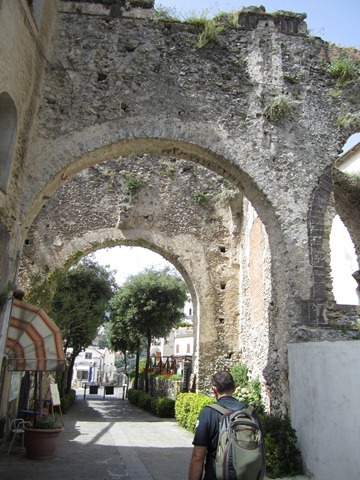 In Sorrento it was 30 euro per day. We were planning on taking the local bus to Ravello, when walking to the bus stop, not 100m from the last rip off hire place, we see scooters for hire for 32 euro. So we changed our plan and got a scooter each! It was so much fun riding the windy coast road. To be honest, I was expecting to crap myself most of the way around, given how narrow the roads are and how crazy Italians drive. But it wasn’t scary at all. It was exhilarating! Zorba was loving it and so was I. 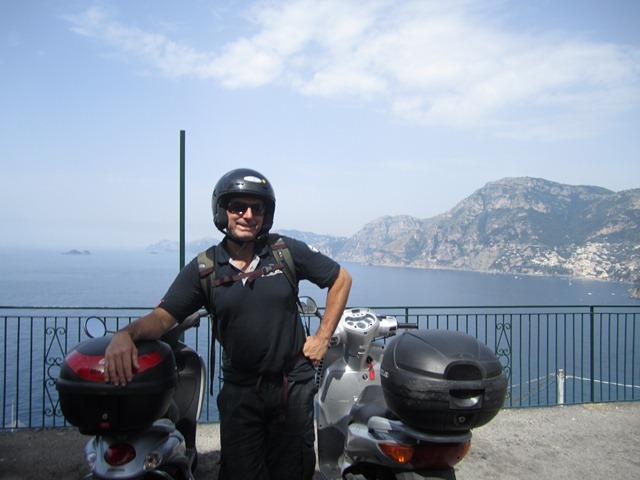 We stopped at Praiano, Amalfi, Minori – where we had a very disappointing lunch (dont’ go there, nothing there), then rode the scenic mountain roads up to Ravello. We rode up the mountain, seeing lush greenery, terraced farm land, and spectacular views from high up the mountain. Sensational. Ravello is lovely. Cute and gorgeous. I spent a fortune on some crockery, an Antipasto set, that will be shipped home. I’m happy – I have wanted to buy crockery from Italy for years. 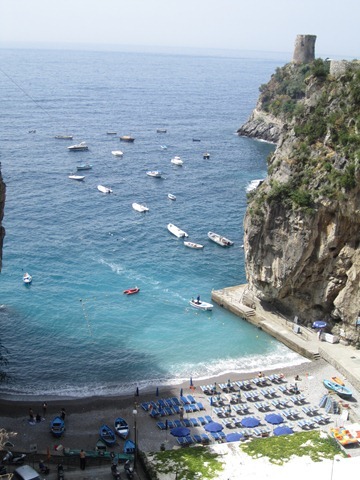 We made our way back to Positano, stopping at Atrani for a drink and look around. The first world cup game was being played, so we sat in a bar and watched the first half, then had to leave to get the Scooters back. Riding back was heaps fun too. We had two of the best days ever!!! We saw the Amalfi coast by boat, then by scooter. Two of the best days ever! And a superb way to spend our last day in Positano, riding a scooter. 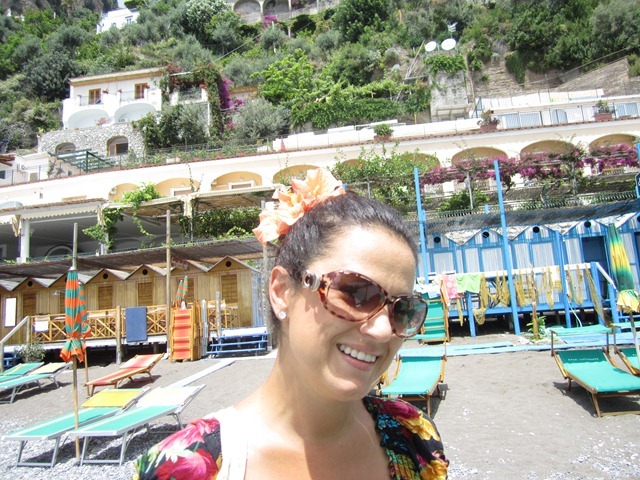 Positano will always have a special place in our hearts – not only is it magical, but it is the place were Zorba planned to propose to me – and then did. We love it and will return.